Required desktop thickness (for clamps) 0.75" - 1.75"
How do Acoustic Privacy Panels work? Our Acoustic Privacy Panels work because they are constructed out of dense, high quality fiber board that was designed to dampen noise from the environment. Installing them on your desk creates a barrier between you and background noise, while also increasing the privacy at your workstation. How much noise can the panels reduce? The 0.85 NRC value, or Noise Reduction Rating, of our Acoustic Privacy Panels means that 85% of the sound waves entering into the material will be captured and converted, while 15% will reflect back out of the material into the room. 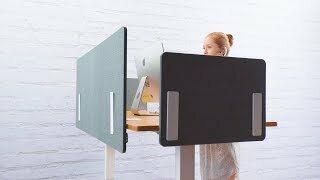 Do Acoustic Privacy Panels work on non-UPLIFT Desks? Yes, our panels are designed to fit a wide variety of desks, from UPLIFT Desks to fixed-height desks. Measure your desktop to see which Acoustic Privacy Panel is ideal for your workstation. Absolutely! Assembly and installation of our Acoustic Privacy Panels is a snap! Just attach the included clamp brackets to the panel with a few screws, and clamp onto the back or side of your desk. How do these increase privacy? When we say these increase privacy at your workstation, we mean our Acoustic Privacy Panels are able to create or wall off a more secluded area, blocking distractions and helping you focus. We recommend at least installing a main panel to the rear of your desk. For a more private desk with sound blocking on all sides, install a main panel and two side panels to your desk. Help! My privacy panel came without mounting holes for the hardware! The holes are there, but they may be hard to see because they're plugged. Look for four hexagon-shaped marks toward the bottom of the panel. These may be easier to see on one side of the panel. Once you find them, simply pop the plug out with your finger. Most office decor is bland. Do I have a choice of color? Of course! We have three colors to choose from: dark gray, light gray, and blue. Pick the panel that suits your style. Contact us for color swatches. What is the purpose of Acoustic Privacy Panels? Flexible Office layouts were designed to foster collaboration between coworkers, but some need more privacy at their workstation without fully outfitting it cubicle-style. That's why we have Acoustic Privacy Panels; they're simple, affordable, productivity-boosting tools to help you work better. Our Acoustic Privacy Panels allow you to create a more personalized and quieter workstation, which helps you focus, leading you to more productivity, and better quality of work. It's like in elementary school when you used your folders during tests to block out distractions - except our panels block sight and sound! Can I pick my hardware? Yes you can pick your Privacy Panel hardware in one of three colors: black, white, and gray. Acoustic Privacy Panels are constructed out of sturdy, dense Polyester fiber board that's .6 inches thick, giving you a wall of protection from office distractions. Additionally, these eco-friendly panels are made from 50% recycled polyester fiber. Our Acoustic Privacy Panels come in a set of sizes to fit on any UPLIFT Desk, no problem. Back, or Main panels, come in sizes 40", 52", 64", and 72" wide and are 15.5" tall. Side panels are 22" wide by 15.5" tall. The back panel is compatible with 42" to 80" desktops. The UPLIFT Desk Acoustic Privacy Panel is available in your choice of three colors: Blue, Light Gray, or Dark Gray. Pick the color that sets that "work sanctuary" mood at your space. You get the chance to pick your Acoustic Privacy Panel's hardware. Match yours to your desk frame or show your coworkers you're quirky and pick a completely different color! We offer hardware in a trio of color options: black, white, and gray. Mounting hardware will clamp to desktops up to 1.75" thick.